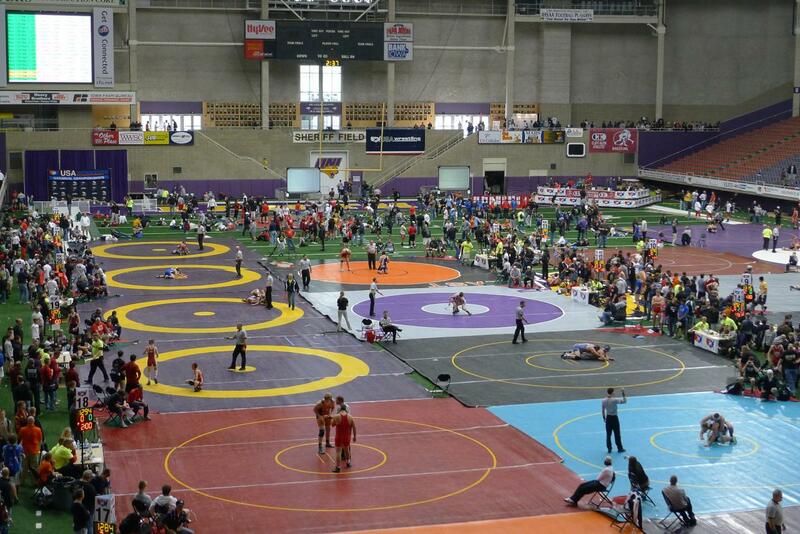 Twenty-six of Louisiana's up-and-coming wrestling stars made the trip to the University of Northern Iowa in Cedar Falls to compete in the Bantam, Novice, Intermediate and Schoolboy Divisions of the USAW Cliff Keen Folkstyle Nationals this weekend. The kids represented the New Orleans Wrestling Club, the Northeast Louisiana Wrestling Club, Team Louisiana and the Tiger Wrestling Club. Many only competed in two matches on Saturday, but, like the Cadets and Juniors who finished their only day of wrestling on Friday, the experience of wrestling in a national tournament and in the UNI-Dome, an air-supported roofed stadium which has held as many as 22,000 fans for wrestling events, made the trip worth the 1,000+ mile drive. Two Louisiana wrestlers earned All-American status in the Kids Groups. Seven of the young grapplers won a match before being eliminated in the double-elimination tournament format. In his first match Eli Larriere (NOWC) defeated an Illinois opponent by a major 11-1 decision. In his second match Zachary Drake (Team Louisiana) pinned a Wyoming opponent in 1:38. Brady Butler (Tiger Wrestling Club) won his first match 4-0 over a north Dakota opponent and was leading 7-5 in his second before losing via a last second score by his opponent from Wyoming. Colton Sonnier won his second match, over a Wisconsin opponent, via a nail-biting 7-6 decision. Reed Bergeron (Team Louisiana) won his second match via a fall in 2:12. Somewhat unfortunately though, that victory was over fellow Louisiana competitor Nathan Henderson (Northeast Louisiana). Louisiana lightening (not the Ron Guidry kind, sadly) struck twice as Freddy Rice (Northeast Louisiana) second match win, a fall in 2:35, was over Northeast Louisiana teammate Landin McCoy.